This is like the OJ trial all over again except this time I'm old enough to be outraged. Casey Anthony has been acquitted of all murder charges and will be sentenced on Thursday for being found guilty of lying to the police. 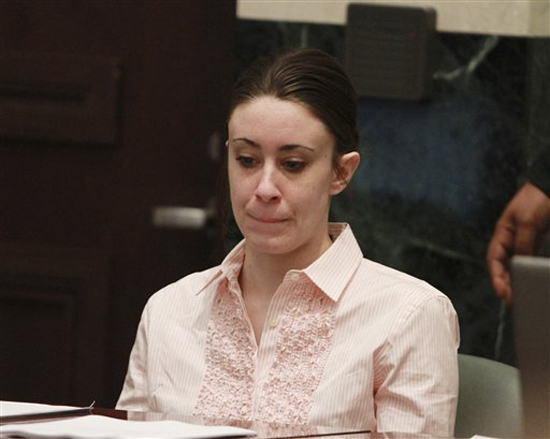 ORLANDO, Fla. (AP) Casey Anthony was found not guilty Tuesday of killing her 2-year-old daughter in a case that captivated the nation as it played out on national television from the moment the toddler was reported missing three years ago. Anthony, 25, wept as the judge read the verdict, which jurors reached after less than 11 hours of deliberation over two days. She was charged with first-degree murder, which could have brought the death penalty if she had been convicted. Instead, she was convicted of only four counts of lying to investigators looking into the June 2008 disappearance of her daughter Caylee. Her body was found in the woods six months later and a medical examiner was never able to determine how she died. She will be sentenced by the judge on Thursday and could receive up to a year in jail for each lying count. Anthony's attorneys claimed that the toddler accidentally drowned in the family swimming pool and that when Anthony panicked, her father, a former police officer, decided to make the death look like a murder by putting duct tape on the girl's mouth and dumping the body in woods about a quarter-mile away. They said that Anthony's apparent carefree life hid emotional distress caused by sexual abuse from her father. Her father firmly denied both the cover-up and abuse claims. The prosecution called those claims "absurd," saying that no one makes an accident look like a murder. Prosecutors contended that Caylee was suffocated with duct tape by a mother who loved to party, tattooed herself with the Italian words for "beautiful life" in the month her daughter was missing and crafted elaborate lies to mislead everyone from investigators to her own parents. Prosecutors hammered on the lies Anthony, then 22, told from June 16, 2008, when her daughter was last seen, and a month later when sheriff's investigators were notified. Those include the single mother telling her parents she couldn't produce Caylee because the girl was with a nanny named Zanny a woman who doesn't exist; that she and her daughter were spending time in Jacksonville, Fla., with a rich boyfriend who doesn't exist; and that Zanny had been hospitalized after an out-of-town traffic crash and that they were spending time with her. Lead prosecutor Linda Drane Burdick concluded the state's case by showing the jury two side-by-side images. One showed Casey Anthony smiling and partying in a nightclub during the month Caylee was missing. The other was the tattoo she got a day before her family and law enforcement first learned of the child's disappearance. "At the end of this case, all you have to ask yourself is whose life was better without Caylee?" Burdick asked. "This is your answer."